Recap of Part 1: After a long email courtship, Roger and I met Tessa’s birth father for the first time and decided to take the next step. Tessa would also meet him — in a few months after some planned events had passed. As we parted at the agency, Joe handed me some photos of him, his baby daughter, and his mom. One afternoon in late spring, Tessa had a root canal, as part of the ongoing saga of a this mishap (we Libertarians are doomed in so many ways, I tell you). To help take her mind off the fact that she couldn’t eat all morning until after the 1 pm surgery, I had the bright idea to have pedicures together. She handled the hunger and the tension fairly well. After all, who could be cranky when having one’s calves massaged and when sporting hot pink toenails? As we talked and waited for our toes to dry, Tessa noticed on the floor my flopped open purse. With the pictures in it. Of Joe. Deep breath. I braced myself for what was coming and how I would handle it. We’ve always though that straight-on is the way to handle things with the kids. I was aiming for the Goldilocks approach: not too much, not too little. “Mommy, can I see those pictures?” I hand them over. “No, Sweetheart. This man is Joe.” I wait for the name to connect to the concept in her mind. Now, it’s one thing to explain a birthmother to a child. It’s concrete — the child sees a pregnant woman, you explain that there’s a baby in there, and that soon the baby will be born (get as descriptive as you’d like). You explain that every baby grows in a mother’s body. It also helps when she knows who this woman is and spends time with her. I don’t know what Tessa is thinking, but I suspect that the concept of a birthfather is much harder to grasp. He didn’t get a big belly. He didn’t carry me around. He didn’t call mom when I was about to be born. So just what is this guy’s connection to me? Yes, we’d had The Talk. That’s a whole ‘nother blog post. Suffice it to say that Tessa knows that a baby is created when the sperm of the man meets the egg of a woman. The baby grows in the woman’s body until it’s ready to be born. The baby will share some traits of both the man and the woman. We kept it simple. We followed the KISS* principle. Turns out I handled the conversation well, but not the situation. This was a very hard thing for Tessa to sit with all summer, as you’ll see in the next episode: The Horrible Wait. Straight forward and simple. I hope I am able to be like that when the donor egg conversation comes up. Somehow I missed installment #1; just read it to get up to speed.Now you’ve got me eating out of the palm of your hand.I can’t help but wonder how the context of this summer and early fall may color this story. Oh, I can’t wait to hear how the rest went. Soon? You’re my hero, Lori, for being able to be so truthful and honest with your girl. Your story gives me so much hope for my own future conversations! Girl, you handle yourself so well! Again, you are my hero.Can’t wait for the next installment!!! Good on you Lori. You do a great job. I’m sure this conversation will continue to come up – I hope so anyway. Big ((Hugs)). Tessa is so lucky to have you as her mom. It is amazing how sometimes something so simple (or something that comes off as appearing so simple) takes so much organization, planning and fore thought. Way to go, momma. Missy has a 9-month old friend from library who is the happy result of an open adoption. Your stories have enlightened me so much. This just blew my mind–I had never really thought about how difficult it would be to explain a birthfather and how it would necessitate the other…cough…conversation. wow – the many layers of mothering that you are dealing with is just astounding. Thanks for sharing the journey. I have to say, I am learning so much from you. 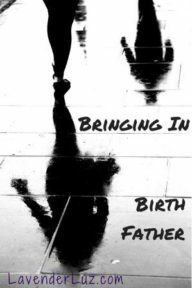 Wow… I never thought about the birthfather thing not being self-evident to a child. I’ll have to ask my hubby if it took him a while to even imagine a birthfather. Sounds like you handled the situation perfectly. I like the KISS principal. Keep it simple. I felt uncomfortable just reading this. I can’t imagine how you felt! When Tessa grows up, I’m sure she will appreciate how truthful you are with her. I’ve met too many adults who didn’t appreciate when their parents didn’t give them the straight truth.